Hundreds of people marched down King Street in Kitchener Saturday afternoon demanding changes to how genetically modified foods are regulated in Canada. The group is part of an estimated 200,000 people targeting Monsanto, an $11-billion bio-tech company. Genetically modified foods are dividing the dinner plate in two, on the one hand you have a company that says it’s helping farmers produce more food, on the other, are people concerned about what they’re putting in their mouths. GMO is genetically modified foods, a farming choice that, some people say is responsible for numerous health side effects. In Canada 81 different foods are GMO approved. 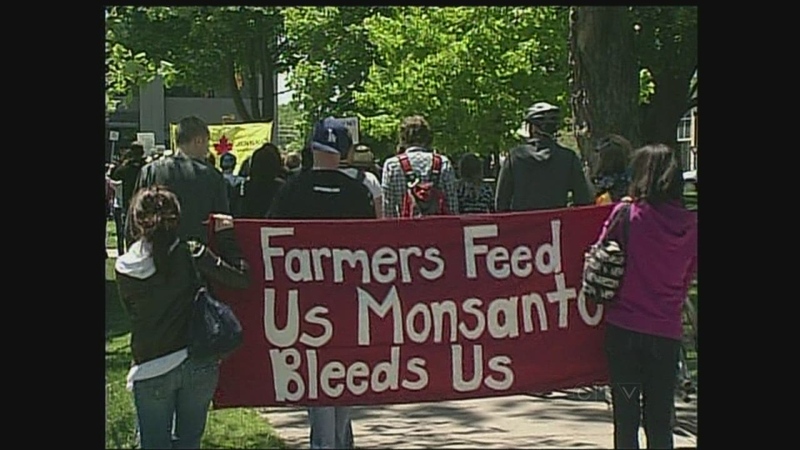 The protestors say if the government knows which crops have been modified, so should they. “We want labels on our food so that we can make the choice of what we want to eat so that we know what we’re putting in our bodies.” Tu says. On Health Canada’s website it lists five separate ways that genetically modified foods are assessed. It says after twelve years, it has yet to find evidence that genetically modified foods are more harmful than traditional foods. Friday American politicians struck down a proposed bill that would make labels mandatory. In response to Saturday’s protests, Monsanto says it respects people’s right to express their opinion, but maintains that its seeds improve agricultural production. University of Guelph Professor Sylvain Charlebois agrees but says labelling genetically modified food would clear the air and likely kill the protests. “By mystifying GMO’s, I suspect consumers will feel more comfortable with Franken foods or farm foods or whatever you want to call them.” Charlebois says. Until labels happen, the group says more people should choose to buy only organic foods. “If we stand up and make a vote with our dollars, we can support local farmers and not support genetically modified foods in our diets.” Tu says. 64 countries are either labelling or outright banning GMO’s, no such plans exist in Canada.